"The C5100B removes the guesswork of low runtimes in a mobile phone. Testing the battery gives the user a clear assessment of battery performance in 4 minutes. Batteries are blamed for most mobile phone problems. The fault is often outside the battery and the C5100B serves as a diagnostic tool. Customers appreciate straight answers and storefront testing obliges them to return with trust. 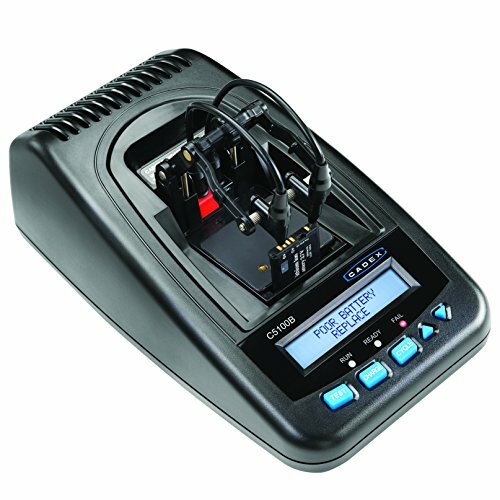 The C5100B battery analyzer improves customer care, increases revenue, reduces costs, and protects the environment by discarding fewer batteries. Services 1 battery; user selectable for Li-Ion - 3.6-3.85V, 500-4000 mAh. Cadex BatteryStoreTM. North American and Euro AC cord. RoHS compliant." "3.6V and 7.2V nominal, 2A, 8W charge and discharge. Polarity protected. Analyzer automatically choses a lower C-rate when exceeding 2A." QS1 (600-1,500mAh), QS3 (use of Q-codes) and QS4 (generic, user-entry of voltage and mAh). QS4 services 3.6V Li-ion up to 4,000mAh with a state-of-charge of 20% and above. "TEST: 4 minutes QuickSortTM CHARGE: 3-hour fast charge CYCLE: Charge/discharge/charge BOOST: Reactivates batteries"
USB, RS232 for unit upgrades. CSA/UL/EN60950, CE mark, RoHS, WEEE. Two (2) year material and workmanship Warranty. If you have any questions about this product by Cadex Electronics Inc., contact us by completing and submitting the form below. If you are looking for a specif part number, please include it with your message.